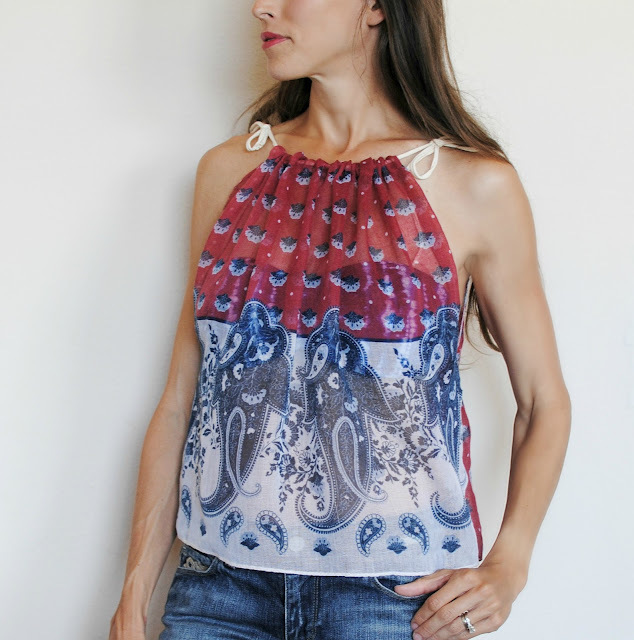 I love this little Bandana top for summer. It's simple, light, and airy. You can use bandanas or scarves for this. Tutorial below. Start with your bandanas or scarves placed right sides together. Sew the side seams up leaving about 6 inches open where the arrows are placed. The edges should be finished on the bottom hem and side seams which makes this fast and easy. If you use scarves or fabric the standard bandana sizes are 22 in x 22 in. You can do whatever width/length you'd like though. Another view of the side seams and opening. Sew the top about 1/2 inch over creating a casing for the string. Then weave the back and tie a bow in the center chain link. You can tack down the ends with a needle and thread to keep the chain in place. Wow, These design giving so beautiful. I want to some dresses like these for my lovely girlfriend. When she will see become very happy as i am to see free playstation codes and play all time on that. stunning, you go girl! 😃 looks like a classy throwback to the 90s! it's a yes from me! What a beautiful idea! Thanks for sharing!
. I hope you continue to have such quality articles to share! your shirt is very beautiful. you are hard-pressed.